If you know someone who will be having a milestone year birthday, no doubt you will be planning something big to celebrate this momentous occasion. At Casino Party Experts, we have the perfect party themes for you. This birthday, ring the milestone year in style with a Casino Royale themed event. First, let’s start by inviting all of the birthday person’s friends, family, co-workers and neighbors to a formal black tie and gown night to remember. Once everyone has been invited, it’s time to organize the decorations. At Casino Party Experts, we’ll roll out the red carpet for this high-end affair. We’ll then place our stanchions and red velvet rope on either side of the carpet to guide your guests down to the awaiting entrance way. On the door, a Queen of Hearts décor will mark the entrance to this prestigious event. Once inside, your guests will be mesmerized by the elegance of the décor. At the entrance way, a life-size statue of three large dice stacked on top of each other will quickly set the tone for the rest of the room. Spades, clubs, hearts and diamonds will hang from the ceiling throughout the room while soft lighting will be used to illuminate the place. Round tables with black and white table clothes can be set up on one side of the room to create a formal seating area. On top of each table, place a clear dice designed vase with red gems inside and spade, clubs, diamonds, hearts and numbered age signs intertwined with a beautiful floral arrangement. Throughout the rest of the room, gaming tables will be set up to entertain your crowd. 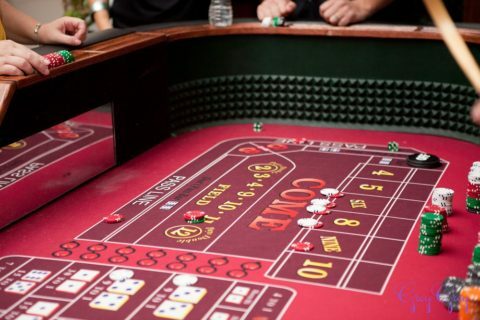 At Casino Party Experts, we have several poker tables including Texas Hold ‘Em, Let It Ride, Three Card Poker, Pai Gow, Caribbean Stud and standard poker tables. Our state-of-the-art card tables are sophisticated gaming platforms that are identical to those found in actual casinos. To book your special event, contact us today at 317-857-0168. We can also set up other exciting games including Baccarat, Blackjack, Roulette and slot machines. Our professional dealers are available to help run the tables. We will supply the cards, chips and play money for each guest to use. While your attendees are enjoying their card games, professional waiting staff can walk around with trays of hors d’oeuvres and champagne. Serve your guests delicious appetizers including shrimp cocktail, gourmet pinwheel sandwiches, bourbon meatballs on toothpicks, roasted cranberry brie on a toasted crostini, baked crab poppers, and cucumber bites. There are several hot and cold appetizers you can choose for the evening to suit everyone’s dietary preferences. Top the evening off with a mouth watering royal chocolate or red velvet dice shaped gaming birthday cake. Sing a boisterous round of Happy Birthday while the star of the party blows out their birthday candles. Once everyone has enjoyed the cake and presents are unwrapped, spend the rest of the night playing your favorite casino games well into the early hours of the morning. Casino parties are perfect for any occasion including birthdays. If you know someone who is turning a special age this year, celebrate their milestone event by hosting a spectacular Casino Royale party. Contact us at Casino Party Experts today at 317-857-0168 to book your extravagant birthday celebration. Plan A Family Reunion Extraordinaire!